Profile: Pounding loudly on his chest plates to announce his latest success is perhaps the least obnoxious of Apeface's habits. He's also known for insulting everyone he talks to, clumsily knocking over anyone in his way without apologizing, never changing his lubricant so he smells like a grease-encrusted turboworm, and spitting fuel in public. He revels in the reactions others have to his undesirable antics. What little imagination he has in his cerebro-circuits he devotes to devising new gross-outs. One would think he wouldn't be too popular with his fellow Decepticons, but actually the opposite is true. He is the ultimate team player. When he's called upon to do a job, he puts aside the pranks and gets down to work. Many think that his slobbish personality is just a disguise he puts on to cover the cool professional underneath. Then again, many others think he acts like a cool professional only to obscure the fact that he really is a slob. When his mind is merged with that of Spasma, the Nebulan to whom he is binary-bonded, Apeface's behavior is often even more repellent. Spasma was the nervous, insecure son of a despised and bankrupt noble family. Seeing his father's failed footsteps as the only path that lay before him heightened Spasma's feelings of worthlessness, which manifested itself in his screechy, staccato manner of speech. He saw the chance to become a powerful Decepticon Headmaster as a way of erasing his feelings of inadequacy. Instead, now thrust into situations fraught with dangers, Spasma worries more than ever. His speech is even worse, almost unintelligible at times, and now, on his own, he walks as herky-jerkily as he talks. Abilities: In jet mode, twin liquid hydrogen-fueled jet engines enable Apeface to reach speeds of 3250 mph. He can emit powerful jamming frequencies from his nose cone, which he uses mainly as a defensive measure to disorient approaching enemy aircraft. Otherwise, he has no offensive capabilities in jet mode. 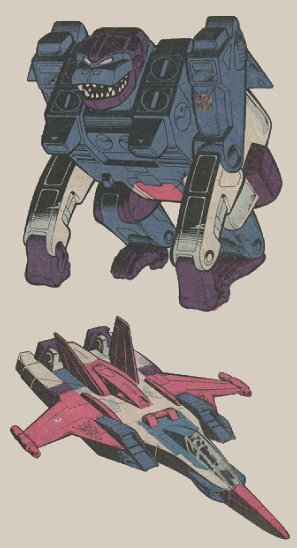 Apeface primarily uses his jet mode to transport himself to the site of his mission objective, where he transforms to his ape mode. In this form, he possesses great strength and agility, which he uses to great effect in climbing about and sabotaging enemy installations. In robot mode, he wields a semi-automatic sonic boomer, which emits wave after wave of concentrated sound energy. Weaknesses: Lack of offensive weapons makes him fairly vulnerable in jet mode. Spasma's often erratic leadership dangerously delays Apeface from reacting to enemy attack.